Toenail fungus is gross, but it happens to the best of us. It’s kind of like head lice: pretty much everyone gets it, and pretty much no one wants to talk about it—even though it has absolutely nothing to do with your personal hygiene. To ease your mind, here are a couple things you should know about having an infected toenail. One, you don’t have to chop off your toe, and two, you don’t have to go to the doctor. Actually, you might have to go to the doctor, but you’ll definitely get to keep your toe. The toenail itself might have to go, but typically you’ll just get an antibiotic prescription and a hefty bill. So before you make the dreaded trip, you should try curing it on your own. Here’s how. Before you do anything, throw out every nail polish bottle you own. If you’ve painted an infected toenail, your polish is going to be infected too—meaning if you get rid of the infection and paint your toenails with the same polish, you’ll most likely re-infect your toe. If you’ve kept track of which polish you used and when, then only throw out what you know could be infected. But realistically, there’s no real way to tell how long a toe has been infected, so it’s better to be safe than sorry. I’ve had my fair share of battles with toenail fungus, and I’ve learned a few things along the way—like how to make the perfect cure-all. I call my favorite toenail fungus home remedy the “Fungus Cocktail,” and I’m perfectly aware of how ridiculous it sounds, but you’ve gotta get your kicks where you can. I basically pour everything guaranteed to get rid of fungus in one giant bowl and soak my toe in it. Get the biggest bowl you can find, fill it up halfway with hydrogen peroxide while the water heats up. Then fill it to the top with the hot water and add a couple drops of tea tree oil (and apple cider vinegar, if you want a stronger concoction). Lay a towel down under the bowl in case any spills out (the peroxide can stain your carpet), and soak your foot for a good 10 minutes or so. After you dry your foot, apply coconut oil to the infected area. Coconut oil is famous for its moisturizing capabilities, but it’s also a great disinfectant. It’s also got this thing called Caprylic acid, which is great for curing all kinds of fungi. Repeat this process once a day until your toenail clears up. 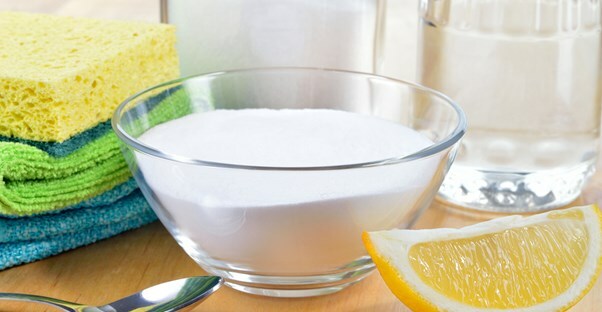 Vinegar and Baking Soda: Soak your foot in a bowl filled with just apple cider vinegar and hot water for 10-15 minutes. Then, once you’ve dried your feet, apply some baking soda to the infected area. This combination will stop the fungus from growing and spreading. Listerine: Listerine mouthwash has alcohol in it, which makes it a great option for getting rid of toenail fungus. Just fill up a bowl and soak your foot for 10-15 minutes. Vick’s VapoRub: Although it obviously wasn’t created as a toenail fungus medication, Vick’s has some magical anti-fungal ingredients in it, like thymol and eucalyptus oil. Try rubbing it on the affected area a couple times a day. Keep in mind that all of these home remedies will take time, typically about six months, before you see serious results. Getting rid of toenail fungus takes patience and determination, and it’s perfectly fine to switch up your home remedy routine from time to time. If one doesn’t work for you, move on to the next, and when all else fails, make a doctor’s appointment.